I am currently working to upgrade this site and add a few new resources. If you notice any issues, please be patient while I work to resolve them. 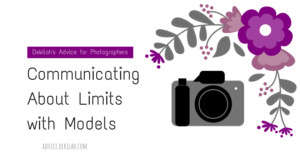 Welcome to Dekilah’s Model Advice, my project designed to help freelance models & those who work with them find answers to common questions and issues related to modeling and model photography. I’ve found that advice intended to be helpful, honest, and constructive can be difficult to come by in this sometimes competitive and unnecessarily exclusive community. I want to change that by offering what I’ve learned and doing my best to answer the questions you have.